Did you know, the average commercial office waste stream in the U.S. consists of approximately 77% recyclable and compostable materials, with only about 23% being real “trash.” This revelation comes from a study of 100 commercial waste audits conducted across the country by Great Forest. 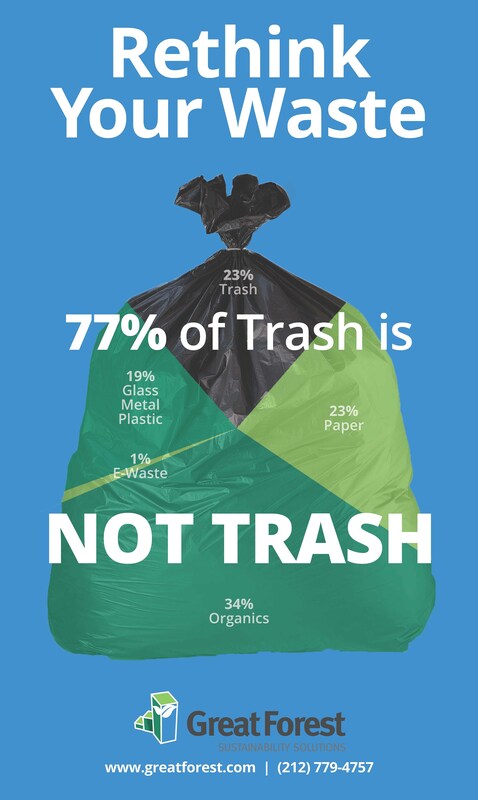 77% of what is usually thrown out as trash is NOT trash at all but is made up of organics (34%), followed by paper (23%), glass/metal/plastic (19%), and e-waste (1%). This means that in a typical business, only 23% of what is being thrown out is actually trash (ie: non-recyclable materials). Not only are many businesses losing 77% of the recyclable commodities they are discarding in the trash, but they may also be paying more for waste removal than they should. That is a lot of lost value. So how much trash is in your trash? How much value are you losing? The only way to find out is to conduct a waste audit. 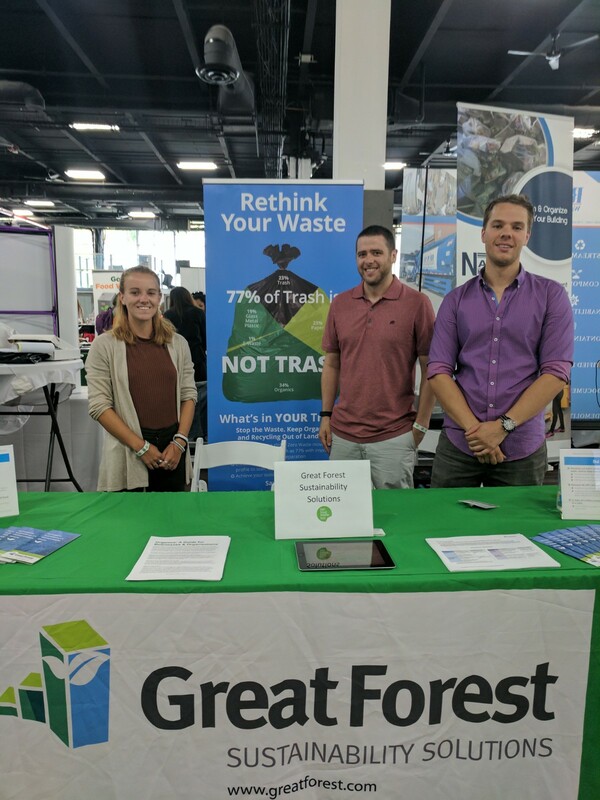 Various businesses that shared their experiences during panels at the NYC Food Waste Fair agreed about the importance of tracking and analyzing waste [read our new waste audit case study]. Dr. Nadereh Afsharmanesh of Earth Friendly Products told the audience that she personally looks in the company’s dumpster each week after discovering that 60% of what was in their trash were recyclables. Sodexo is reportedly conducting waste trainings to teach select staff how to do waste audits. The answer is simple. You can make a BIG impact just by capturing and effectively dealing with ALL your recyclables, including organics. To do this, start with a waste audit. Find out what you really are throwing away. A waste audit will give you the crucial data you need to make informed decisions, including improvements that can be made to your existing waste and recycling program. Consider a centralized waste bin system. 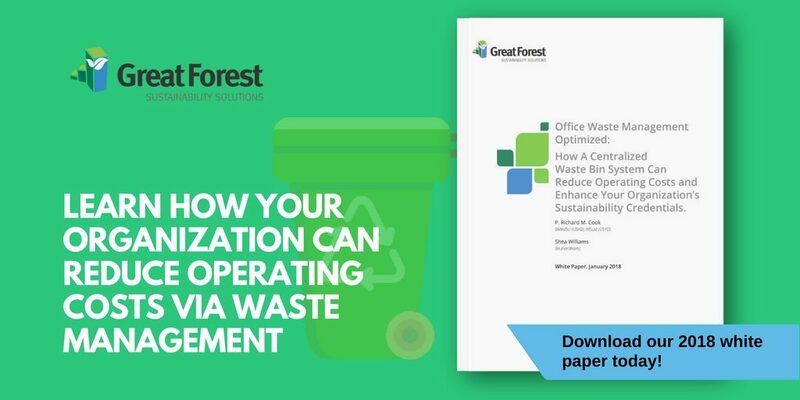 Companies can reduce what goes into their waste stream by implementing strategic waste management initiatives that improve separation of waste materials. A centralized waste bin system is one of the easiest ways to do that. Download this free white paper to learn more. This entry was posted in All and tagged food waste, food waste fair, waste audits. Bookmark the permalink.